Hey, I was always under the impression that using salt on Anabantoids was a bad idea and that it can hurt the labyrinth organ in some way. Is this false? And are there any research articles or studies you are aware of that I can read on the subject? Sorry to bug you, I know you have lots of ppl to help, you just seemed like a good place to ask. 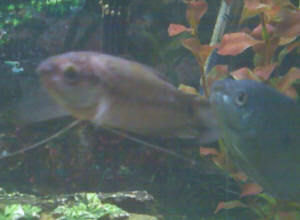 Hello My name is Vincent and my female pearl Gourami has a few problems. I have a well established ten gallon tank that has been housing this fish for about 3 years and her roommate, another male Gourami, for 4. I have never had any problems with water quality nor have there been any pH spikes things of that nature. The water in the tank is kept at 70-74 degrees F and is carbon filtered as well as filtered by the resident Java ferns. My female pearl is my favorite fish so I have always paid close attention to her. The weirdness started about a year ago when I noticed a white spot developing on her ventral fin. I watched it but it did not seem to do anything or harm her so I chalked it up to her fin's natural growth. Then I started noticing her swimming, it became weaker, more spastic, like she had to devote more energy to swimming than a normal fish would. Her dorsal fin and tail fin have since been drawn in and folded and she maintains her body at a strange bent angle as if she is constantly avoiding something to one side. Her pectoral fins, the ones that look like feelers, are no longer straight and are kinked at odd angles to the point of not being straight or rearward oriented. 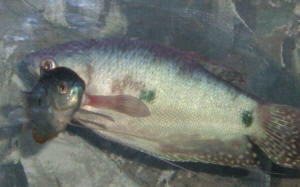 The fins adjacent to her gills are torn and have small lumps on them and one of the fins looks bloodshot. I have tried several different treatment regimens, first under the assumption that it was Ich then fungal infection then fin rot but nothing has worked. I have tried maracyn and TriSulfa to no success, with the carbon removed. The only thing those did was devastate the bacterial community in the tank until the ammonia levels spiked. I have no idea what this thing is at this point. I know that it is slow acting and does not prevent her from feeding or reduce her appetite but other than that I have no idea. Please help. I do have another tank that could house the fish, the only problem is that the tank is maintained by my parents at home while I am away most of the time at college. As such I am hesitant to place her there as there since they are far too preoccupied to actually invest the care that this fish needs and she would likely die there as well. I going to remove the tank mate when I go home for Thanksgiving break raise the temperature and hope for the best since I cannot entrust her to the care of people who have no experience with fish. At any rate thank you for identifying the problem and I appreciate the quick feedback. I only asked this because I did not see any other references to this on your site and because all of the other fish I have been fine in the tank and have suffered no problems. For a bit of lighter news yes I am American and spastic is not an insult here rather a way of describing a motion that looks uncontrolled or sudden or caused by pain. You can use it as an insult though it is far down the line in terms of offensiveness. We do not use the word to insult developmentally disabled persons nor to connotate retardation. Spaz, the colloquial term, refers to a clumsy or inept person and is not a slur.